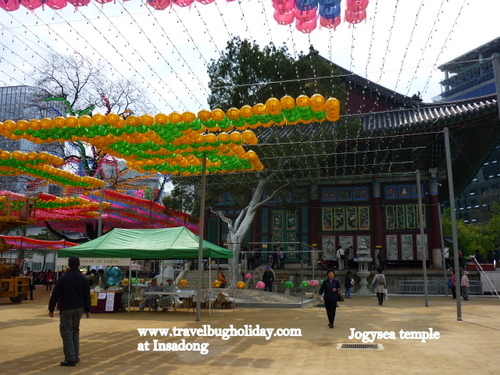 If you are in Insadong, don't forget to visit the nearby Jogysea temple. This beautiful temple is full of colours especially during Buddha’s birthday. 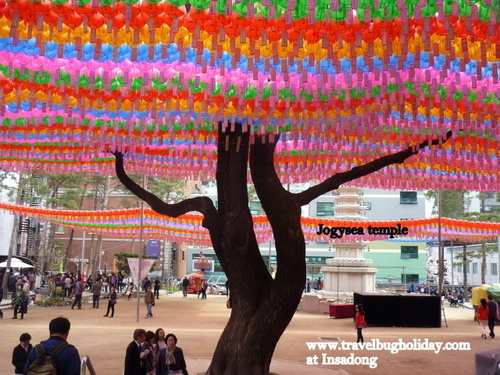 This is a Zen Buddhist temple with lovely courtyard and is decorated with colourful lanterns on tree tops and the tree in the middle is more than 500 years old. Across the road, you can get information for temple stay. Next door is a first postal office in Korea. It is now a museum. 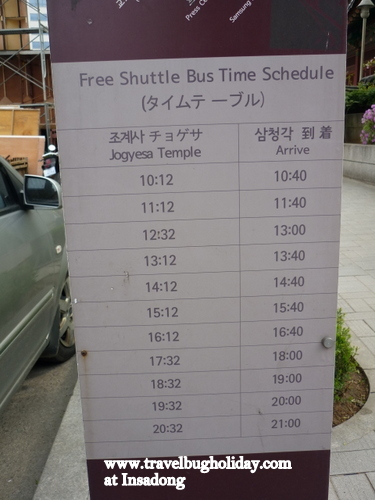 Infront of the Jogysea temple, there is a free shuttle bus that can take you to other tourist places. I find it quite handy as it is like a hop on and off bus. The only problem is that the bus may not be on time if there is a bad traffic jam. I waited for 20 minutes after the allocated time of arrival. Next to this Jogysea temple, there is a postal museum. Entrance is free. 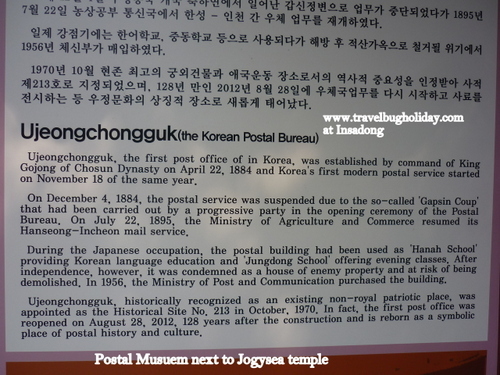 It is quite an interesting little museum as it tells you about the first postal office in Korea. 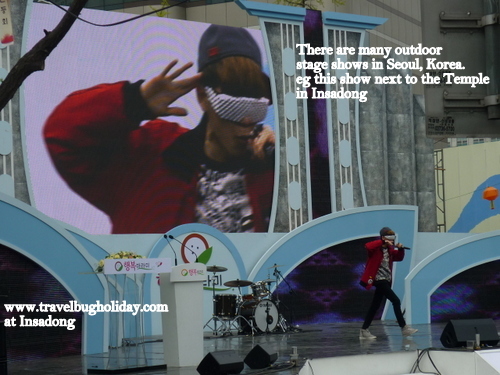 If you are lucky, you might see stage concerts ( very common in Seoul). I was lucky as I was there around the time of Buddhas birthday and on the weekend, they put up a real great stage show with lots of singing and dancing K-pop style. I read that the place to be on New Year’s Eve is Bosingak Belfry, the “Times Square” of Seoul. To join in the festivities, head to Euljiro 1-ga Station exit 3 or Gwanghwamun Station ex. 5. (Bosingak Belfry is actually closest to Jonggak Station on line 1, but because of the large number of people gathering there the trains often skip that station on New Year’s Eve.) Leave early, expect a huge crowd, and enjoy the fireworks at midnight. . A special ceremony is held on New Year's Eve where the bell is rung 33 times in front of large crowds. The bell served as a siren. It is also said that in the Jaseon period, the hour of the day were announced here by toiling this bell. This practice from the past is reenacted daily even to this day. 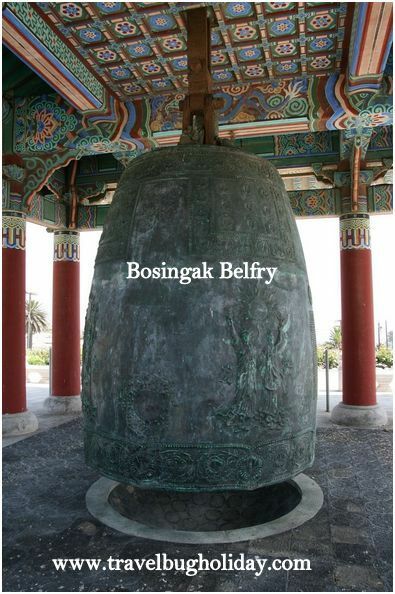 Currently, a daily bell-ringing ceremony is conducted at Bosingak daily but closed on Monday. - Foreign visitors may participate in the program on Tuesdays (onsite registration). 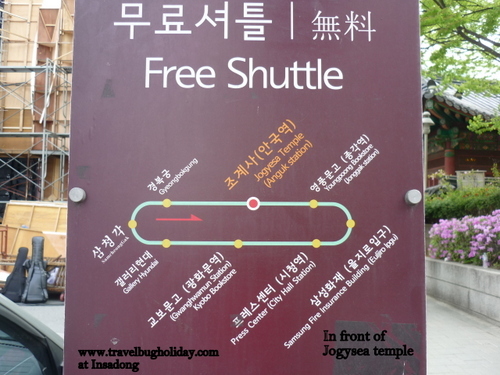 You can get there by getting to Jonggak Station (Seoul Subway Line 1), Exit 4.